Its that time again, where I update you on my current skincare routine. I think its had a pretty big switch up since the last time I did a post on it, so this should be fuuuun. Obviously the first step to any skincare routine, is removing makeup. I’m still using my very trusty Garnier Micellar Water. I’ve been using this stuff practically since it hit the shelves, as it just does the job so nicely. I have however, been using a new cleanser. I obviously mentioned this in my Glossier haul, but its the Glossier Milky Jelly Cleanser. 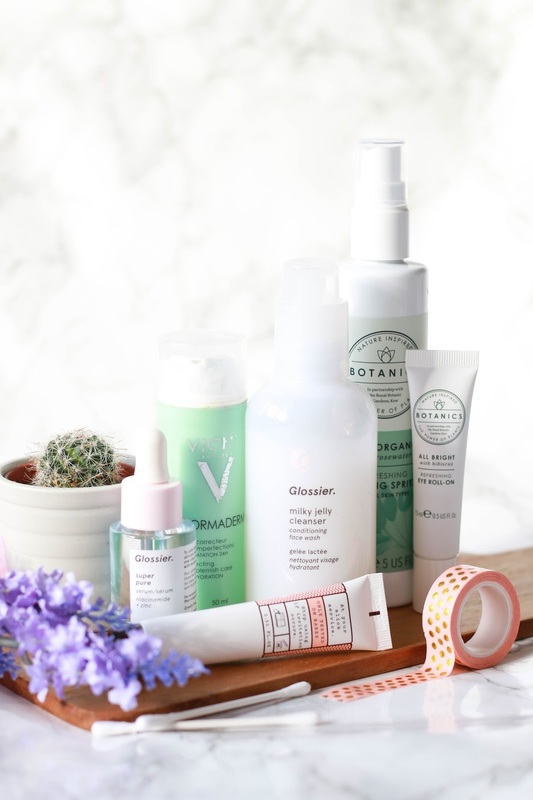 I’m honestly so happy that Glossier finally made its way over to the UK, as I’ve been desperate to try out some of their products. The jelly cleanser has a gel like texture to it, and massages into the skin beautifully. Its brilliant at removing any last traces of makeup, and it makes my skin feel so nourished – its fab. As for toner, I’ve been using the Botanics Organic Rosewater Toning Spritz*. Botanics had an entire relaunch, and their new packaging is just to die for. I’ve been loving this, I just spritz it all over my face once I’m finished cleansing. I usually clean my teeth whilst I let this sink into my skin. It just feels really refreshing, which I love. Once thats all sunk in, I pop some of the Botanics All Bright Refreshing Eye Roll On*. I used to use an eye roll on ages ago, but sort of stopped as I wasn’t seeing much of a difference. However, this is really lovely and it helps to de-puff (is that even a word), my under eye area and feels really cooling. Something I’m genuinely excited to talk about next, is the Glossier Super Pure Serum. I’m a sucker for a good serum, and I’ve tried a handful over the past year or so, but this is by far my favourite. At £24 a pop, its not the cheapest thing ever, but well worth it if you have acne/spot prone skin. It also really helps to reduce redness, which I also suffer with. After the first three days of using this, the redness in my skin was definitely reduced and I hadn’t formed any new spots. So far, I’m really impressed and would highly recommend it. I have no doubts that this will be featured in a post again soon! Finally, onto moisturiser. I’m still using the same one that was featured in the last post I believe, but thats mainly because I still haven’t finished it. Its the Vichy Normaderm Anti-Blemish Cream. This is meant to help with blemish prone skin, and I must say, I haven’t seen it help my skin a huge amount but it does the job. Although its quite heavily scented, so if you don’t enjoy fragranced products I’d steer clear of this. Finally before I go to bed, I pop on some lip balm and for this I’ve been loving the Frank Body Lip Balm. It has a subtle coffee scent to it, which is soo nice! And there we have it, my current skincare routine. I’m actually really enjoying all the products I’m using at the moment, except maybe the moisturiser but I never seem to be happy with that. If anyone has any moisturiser recommendations for combination/blemish prone skin, I’d love to hear!